We're providing local businesses with low cost telephone line rental and call tariffs, all with unbeatable customer service. Local telephone exchanges and cabinets are being upgraded now to provide Norwich businesses with fibre broadband speeds of up to 78Mb. A robust, powerful, feature-rich solution that is completely scalable and can be expanded to meet your communications needs both now and in the future. Powerful communications with a small business price tag. This unique platform is the ideal solution for any small business. Fast, uncontended, and robust - Fibre Leased Line & Ethernet First Mile solutions from Norwich Telecoms. From a single user to fully integrated solutions, we provide flexible and scalable hosted phone systems for businesses of any size. Norwich Telecoms – The Telecoms Solutions Provider for Norwich & Norfolk! Norwich Telecoms specialise in the design, installation, and maintenance of NEC PBX and VOIP business telephone systems. To complement our systems solutions, we also offer a wide range of business telecoms and datacoms solutions to provide a single and local point of contact for our clients. We are based in Norwich, ideally situated to serve businesses in Norwich and the surrounding areas of Norfolk. Supply, installation, and maintenance of a comprehensive portfolio of NEC business telephone systems including the SL1100 and SV8100, as well as providing support for legacy systems such as the XN120 and Aspire. Crucially, our solutions are tailored to the business, not to technology, with each system project managed from planning through to implementation and after sales support. 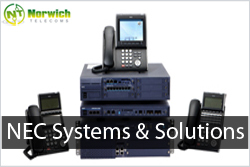 Further information on the telephone systems provided by Norwich Telecoms. Hosted solutions ranging from simple installations (ideal for small businesses looking for cost reductions while gaining increased call functionality), to fully-integrated solutions, which use powerful call management tools that grow with your business. Further information on the VOIP telephone systems provided by Norwich Telecoms. Your telephone system is vital to the smooth operation of your business. Should the worst happen, staff are unable to work effectively and customers will be able to contact you. Norwich Telecoms offer flexible, cost effective, maintenance agreements that are tailored to the requirements of each individual business. Find out more about telephone system maintenance from Norwich Telecoms. Norwich Telecoms are able to offer businesses significant savings on their phone lines and calls tariffs. We understand that each business is different, and how frustrating it can be trying to discuss your business telecoms requirements with some of the large, national telecoms companies. We strive to provide our clients with low costs telecoms solutions and local, good old fashioned unbeatable customer service. 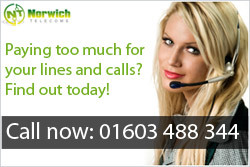 Find out how much Norwich Telecoms could save your business with low cost telephone lines and call packages. Ethernet First Mile (EFM) delivers un-contended, guaranteed, symmetrical, dedicated bandwidth up to 20 times faster than Broadband. With dedicated speeds from 10Mb to 1Gb, Fibre Ethernet Leased Lines offer the ultimate in performance and reliability for your business. Further information on the Leased Line and Ethernet First Mile solutions from Norwich Telecoms. Norwich Telecoms provide competitive mobile phone tariffs for business. We are able to offer all the benefits of the major networks with local, dedicated customer services and flexibility. Mobile solutions from Norwich Telecoms provide a one stop shop for the telecoms requirements for your business. Further information on business mobile packages from Norwich Telecoms. 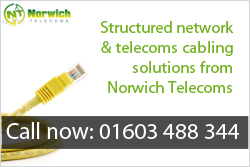 Norwich Telecoms design and install CAT5e and CAT6 structured networks. We can make additions or changes to existing networks within short lead times. We utilise industry leading network test equipment to quickly and efficiently diagnose faults on existing networks that may arise. In addition to CAT5e and CAT6 networks, we also have experienced fibre installation engineers capable of providing high speed, high bandwidth, single mode and multi mode fibre optic installations. Further information on CAT5e and CAT6 network cabling in Norwich. Installation of new telephone extensions and lines. Relocation of existing telephone extensions. Fault finding and rectification of telephone extension issues. Installation and wiring of CW1308 cabling. All telephone engineer services are available to both residential customers and businesses in Norwich and Norfolk. Further information on telephone engineers in Norwich. What areas do Norwich Telecoms cover? Acle, Attleborough, Aylsham, Caister, Cromer, Dereham, Diss, Downham Market, Fakenham, Gorleston, Great Yarmouth, Harleston, Hingham, Holt, Hunstanton, King’s Lynn, Loddon, North Walsham, Rackheath, Reepham, Sheringham, Stalham, Swaffham, Thetford, Watton, Wells, Wroxham, and Wymondham.